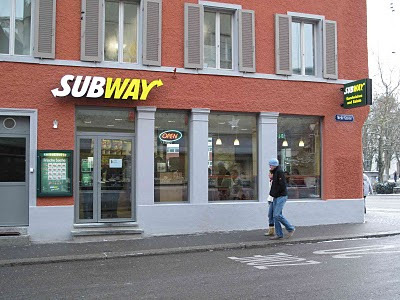 I was really excited when I heard Subway was coming to Baden. Finally, a place to go in Switzerland where a sandwich includes more than just bread and one ingredient. But then I found out the prices. CHF 18 ($18) for a "Foot-long" value meal? Maybe I'm not so excited about Subway after all. I could have a "Sub Platter" for that price in the U.S.
Alas, the prices aren't stopping the Swiss (they never have). Whenever I walk by, the Subway in Baden is always packed with people. Elementary school kids, teenagers, adults. Apparently, the Swiss are warming to the idea of eating chips with their sandwiches. And shelling out the big Francs to do it. In other American fast food news, apparently they are going to renovate the Baden train station (the oldest train station in Switzerland) and install a Starbucks next year. What's next? My little medieval Swiss village is slowly selling out. McDonalds. Burger King. Subway. Next thing you know, we'll be celebrating the Fourth of July too. What do you think of all this Americana taking over Switzerland? >>What do you think of all this Americana taking over Switzerland? Sorry, it is so,so sad! Maybe a different matter if the invasion spoke for something of more value and admirable qualities than than corporate branding and commercialism.. I was so sad to return to Zermatt once and see a McDonalds there. Granted probably the nicest looking McDonalds ever, but it shouldn't be there. If you needed fast food what is wrong with the tiny, tiny crepe shop? I agree that it's sad, but the Swiss seem to be supporting the madness. They pack these fast food places. I don't know if it's because there's no where else open (especially after 10pm) or the (relatively) cheap prices. In the US, I never went to Subway. But since living here, I've driven 45 minutes into Annecy, France to go to one. As long as they're not building strip malls filled with TGI Friday's and Outbacks, I'm okay with a little Americana. Never been to Oaxaca, Mexico, but when I heard the town revolted and refused McDonald's license to build in their Old Town, it made me want to visit. As an American, I love a little taste of home as well when I'm far away. Hopefully Switzerland is still light years away from the strip-mall Americana.